I bought it to make BabyLiu a Cal colored hat to wear to games. But then BabyLiu decided she both hated football and hats, so I didn’t. But another football season will begin this fall and I will try all over to get her to both wear hats and go to the games with us. Since we just discovered her grandparents are looking to move out-of-state by September of this year, I’m really hoping she takes to the games this year. Otherwise I’m gonna be out a couple hundred dollars. But I digress, back to the yarn. The yarn is Twirl Colors in Lost Dog Blues and Twirling Mangos (neither of which I see on the website, but I’ve had these for at least a year now). The ball bands tell me the yellow is frond a sheep named Beatrice, who is an orphan with a white fleece. 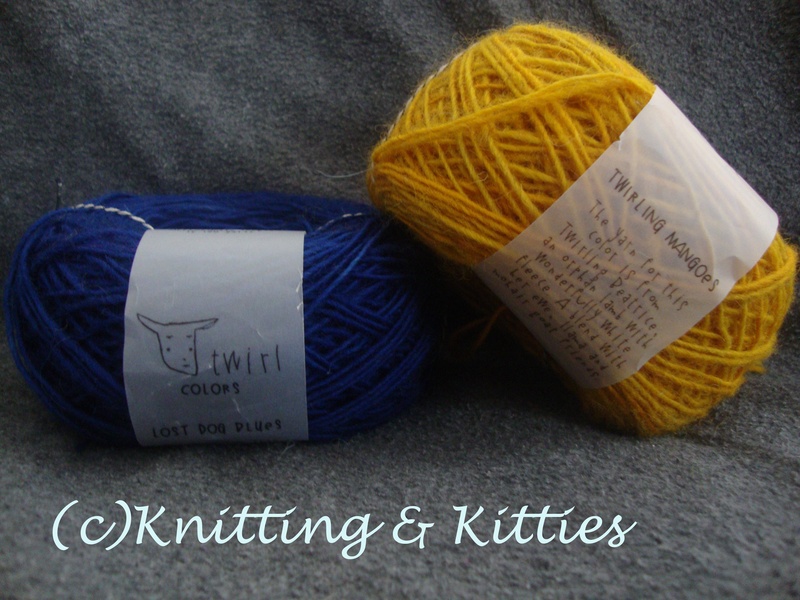 It’s a blend of wool with “llama and mohair goat friends.” The blue is from a sheep named Bunny who arrived on Easter and is 100% wool. They’re both beautifully soft and vibrantly colored in a way that my crappy photographing skills do not do justice. I’m absolutely tickled to know the names of the sheep who donated their coats to give me something to knit and a warm hat for my daughter to wear. I was even more tickled to find that this is locally sourced. Or, at least, as local as it gets when one lives in a city. Now I just have to decide what to knit. Do I just go with simple stripes? A hat with bear ears? A hat with fair isle bear motifs? Or something else? Any suggestions? This entry was posted in Baby, Patterns, Yarn. Bookmark the permalink.